Welcome to the soccerlco Team Room help page. The information below will walk you through the process of creating an account and logging in to shop club apparel items from the kit builder. While this help page should answer most of your questions, our Customer Service team is always available to help by phone (858-430-0476) or email at customer-service@soccerloco.com. In order to shop club apparel and receive your discounted club pricing, you must create an account on our site. Each time you come back to shop soccerloco.com, make sure to log in to your account. Hover over Team Room in the top navigation and click the name of your club. If you don't already have an account, fill in your personal information and click Create Account & Log In. If you already have an account, fill in your email address and password and then click Log In. Once logged in, you should be taken to your team room homepage where you can begin shopping. After clicking the Team Room link in the top navigation and logging in, you will land at the team room homepage displaying the various shopping options. Shop for One Player - Best option for most customers. You'll be walked through the correct items for your specific team. Shop for the Team - Best for team managers placing large, multiple player orders. Shop for Extra Items - Best for purchasing add on items after your initial uniform kit purchase. Shop for Fan Gear - Best for purchasing fan gear items. The Shop for One Player option is the most efficient way to shop for most customers. You will create a player profile by selecting your group (gender/age range/etc.) within the club and then defining your player's name and number. This information is then saved and automatically applied to items you select which include customization. 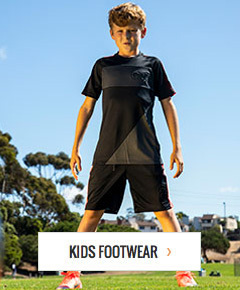 Once your player profile is complete, the system will walk you through each category of products for your club as you select sizes and quantities before adding items to your shopping cart. Click Shop for One Player from the Team Room homepage. Select your club group (ex. Boys, Girls, Boys U8-U14, etc.) and click Continue. Make sure to choose the correct group as this determines what products you are shown later on in the kit builder. Enter your player's first name, last name and player number and sizes before clicking Continue. Please note the size selections are not final and can be changed when adding items to your cart. This simply helps to quicken the shopping process by pre-selecting your size on items. 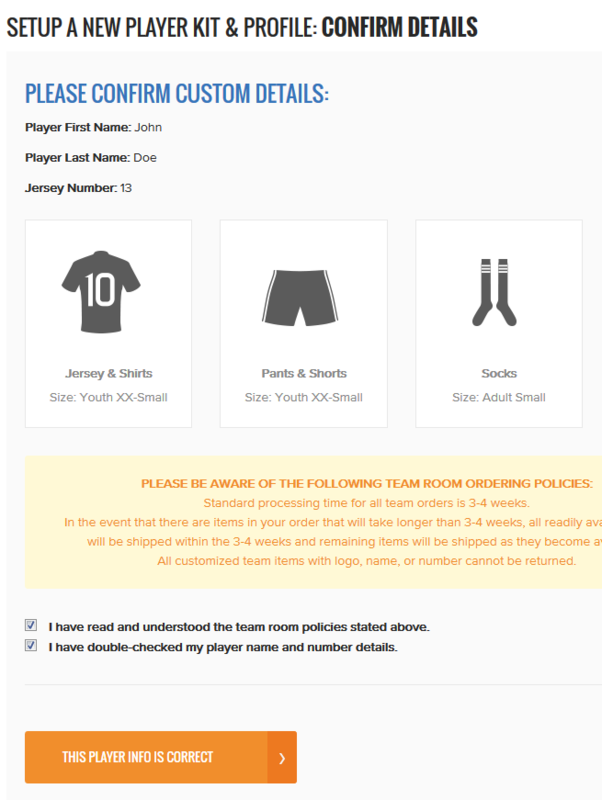 Double check your player details and tick the checkboxes to confirm you've acknowledged the Team Room ordering policies before clicking the This Player Info is Correct button. After you've selected your team group, created your player profile and confirmed your player details, it's time to add items to your cart. The appropriate products for the group you selected during your profile setup will be organized into categories such as game day, training, outerwear, fan gear, etc. Within each section select the quantity you wish to purchase on each item before clicking the Add to Cart & Continue button at the top or bottom. If you don't want any items from a specific section, simply leave the quantities at zero and click the Continue button at the top or bottom. As you continue through each category, the items you selected will be added to your shopping cart in the top right. Once you've made your way through all the categories for your group, you will receive a "success" message asking what you'd like to do next. 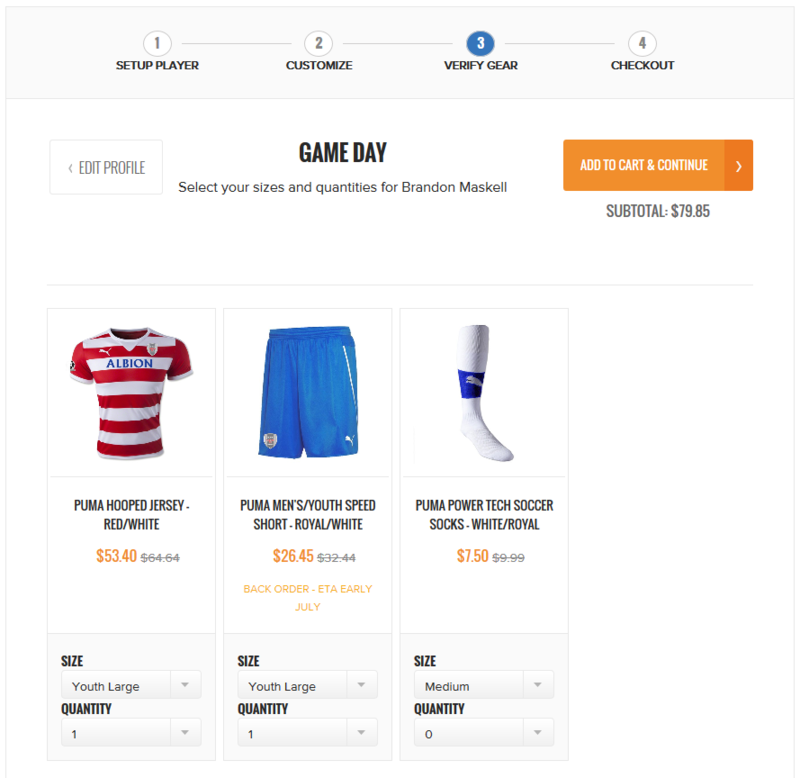 You can either create another player kit, continue shopping retail items or view your order and checkout. A player profile needs to be created for each child to ensure name and number customizations are applied correctly. The easiest way to shop is by creating the first child's profile and adding all kit items to the cart before creating the second child's profile and doing the same. Due to differences in styles and customization between clubs, orders for different clubs must be placed as separate transactions. Create your first child's profile, add necessary items to your cart and checkout. Once the first order is complete, click the second child's club name from the Team Room drop down menu to switch clubs and repeat the kit ordering process you just completed for the first child. The Shop for the Team option was created specifically for team managers and those placing large orders for multiple players. Instead of setting up player profiles, name and number customizations are added on a per item basis. By default, the first section Game Day will be expanded and showing the items for your selected team. 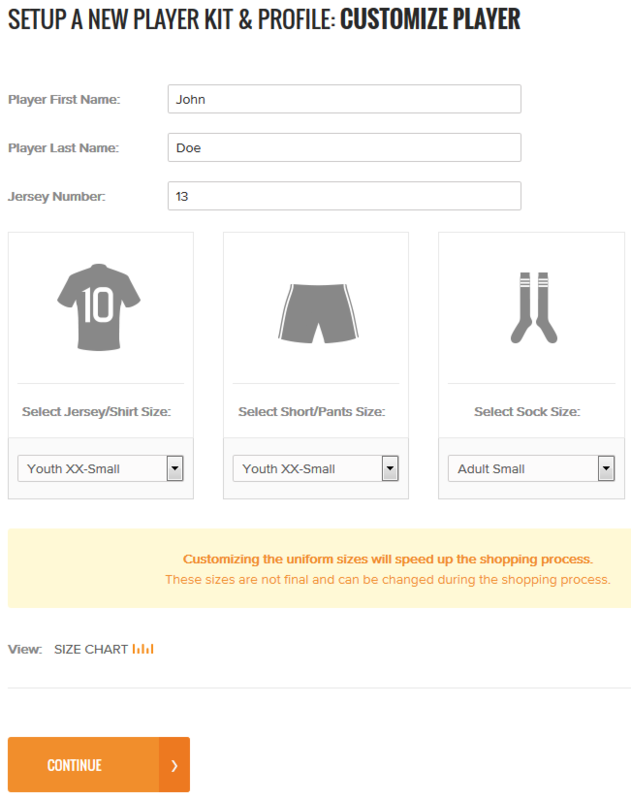 Select the size and quantity for each item you need and enter player name and number information as necessary. To add another unit of the same item but for a different player, click the Add Player button and fill in the necessary information. To add multiple non-personalized items in the same size (ex. 12 small socks), select size and quantity accordingly. Once you've entered all Game Day items, click the + sign on the next greyed out section to open it and begin adding items. The Game Day section will be minimized, but your selections there will be saved. Move through the remaining sections adding your necessary items. Click Add Items to Cart & Checkout. The Shop for Extra Items is intended to be used for add on purchases after you've ordered your full kit. Once you select your team, all appropriate products are presented in a catalog format with filters on the left. Instead of using player profile information, name and number customizations need to be added on a per item basis. By default, Game Day will be selected in the left side filters and those products will be showing. Use the filters on the left side to move between product categories and add all necessary items. Your selections will be saved as you move between categories. Click Add Items to Cart & Checkout to move your items to the cart and begin checking out or click Add Items to Cart & Continue Shopping to move your current selections to the cart while remaining on the page to add more items. The Shop for Fan Gear option functions the same as the Shop for Extra Items option but by default lands you on the fan gear category.